Since I've been delayed a bit on the engine, I'm going back around to another non-functional item: horns. When I first put the battery in, there was power at the horn relay when the horn ring was pressed. The relay itself was bad. I replaced the relay, and now there's not power on the line from the horn ring. The horns will sound when I jumper hot to the small contact on the relay. So the relay & horns are good. Trying to figure out the rest of it. This setup seems to work by providing hot to the relay. Is the wire off the left side of the steering column above the steering box & forward of the firewall - is that for the horn? Is that power out to the horn relay, or power into the horn ring/button? I would like to know what is on both sides of the horn ring/button - to see if the failure is in there. I searched the other horn-related threads on here. This horn relay appears to work with hot on the small contact, not ground as it seems to be on later versions. Thanks! In looking at dashboard / steering wheel photos of '50, '51, '52, all of the photos that show the steering wheel in the car show a wider, rounded spoke on the horn ring. Example: Here is an example with a narrower, non-rounded horn ring. What car(s) was this on? Here is the non-rounded-spoke horn ring by itself: I have not found a photo of the non-rounded-spoke horn ring in a car. Anyone know what years/models used this? I need help identifying what kind of horn this is and how to power it. It only has a Patent No. and no other markings or labels. I have been searching the internet and cannot find any other horns like it. I am curious of what kind of vehicle it would have been on. Any kind of info is greatly appreciated. Thanks. 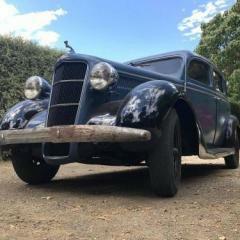 Problems I am having with my 1940 Buick Special. I like to resolve things on my own, partially because I am on a limited budget. A very significant problem with exhaust manifold cracking was successfully resolved, largely with advice I got here on the PWD blog. I published a memorandum on that resolution here. [*]Draining the engine block -- Numerous attempts have failed. The block drain was just a threaded hole when I got the car. I poked around many times with a wire and only got a greasy wire. I applied 80 pounds of air pressure (after opening and draining the radiator) and had no result. I was hoping for some bubbling sound, but got no sound at all. [*]Reinstalling the door handle lift spring -- I replaced some broken glass on the driver’s door. A coil spring associated with the door handle fell into the door while removing the handle. I retrieved it. Removing the door upholstery does not allow me enough access to replace the door handle lift spring. The door handle works fine, but "slumps" in rest position. Is dangling the spring on a thread the approach I should take? Which way should the spring cog be facing? [*]Calibrating the speedometer -- I needed to replace the backing templates on all gauges. The speedometer needle kept falling off and eventually got lost. I made one from some sheet plastic and a hollow rivet. I can make it read fairly accurate at 40 MPH. When it goes over 50 it has a mind of it’s own and easily rolls up to 80 MPH (I’m guessing I am going less than 60). Is the weight of the needle a factor here? Adding weight seems to make no difference. Would dissembling the whole mechanism and cleaning it help? Is sending it to a rebuild shop (expensive) the only resolution? [*]Non banjo style horn button assembly -- My Special does NOT have a banjo style horn button. The spring inside of the steering column does activate the horn. Many of the parts are present. The rubber seals are cracked and brittle. No sign of any spring or cushioning apparatus. The horn button comes off without any provision for keeping it in place. I cannot find information on what parts make up this horn, or where I can find parts that are missing. 53 Buick Solid Spoke Steering, horn components help Anyone had experience with this? There are some missing pieces, that don't seem to be manufactured anymore. I believe I am missing: 1. some kind of spring under the horn cup (attaches to plastic steering wheel housing and pushes up the cup. 2. a strap that goes on top of the horn button piece connected to the wire. It is called a retainer in other horns, and might be a few pieces, a strap with a retainer on each side. Anyone have a pic on the missing parts or a lead? Have searched and called some. Any universal kit that will do the trick? The insides were all wrapped with electrical tape to keep the horn from activating all the time. Thanks.